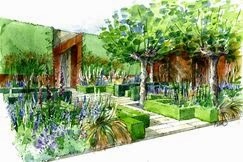 This is the second of my posts looking at the forthcoming show gardens for the 2015 RHS Chelsea Flower Show. Of course this is only focussing on the main show gardens, there are several categories of gardens and the other ones should not under-estimated for their ingenuity and style. Indeed sometimes the smaller gardens use their space with greater imagination. On saying that, I am still concentrating on the main show gardens at this moment. 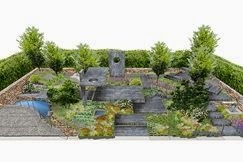 I am very much looking forward to the Royal Bank of Canada Garden which is being designed by Matthew Wilson. 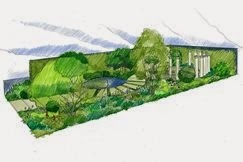 As a fan of his work with the RHS and someone who enjoyed his (too brief) series called The Landscape Man, I will be really interested to see this garden. It is based on the dry garden principle that he used whilst with the RHS and whilst we seem to have little drought here at the moment, it is a style that can be used to great effect. I have high hopes. Next my mind moves on to wine, this happens often, but in this case it is the Cloudy Bay Garden in association with Vital Earth which is being designed by Harry and David Rich. Their garden last year was high on the ‘rather wonderful’ scale so I think it is fair to expect something good. The garden is based on the characteristics and tasting notes of two Cloudy Bay wines and there will also be a moveable shack in the centre of the garden (not to be misread as a moveable snack, which might lead you to think how kind it is to provide nibbles to go with the wine….). Cloudy Bay Garden in association with Vital Earth. The Beauty of Islam with Al Barari Firm Management LLC (short snappy title) is next. This is being designed by Kamelia Bin Zaal and is meant to show us a sanctuary in which to both relax and feel inspired. 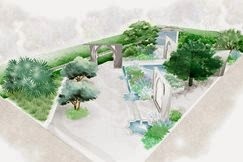 The design aims to reflect Arabic and Islamic cultures and it is the first show garden at Chelsea Kamelia has designed. The Beauty of Islam Garden. From the Beauty of Islam to the Beauty of Kranji with Esmond and Uniseal Garden. This garden is also designed by designers who are new to Chelsea, John Tan and Raymond Toh. 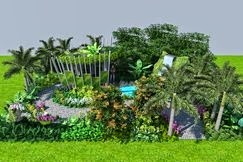 Kranji is a suburb of Singapore and this garden aims to reflect its tropical nature. Again the plan does not really give me much of clue what I am going to be seeing, so it will be interesting to see the reality of it. 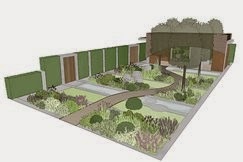 Then there is the Brewin Dolphin Garden which is being designed by Darren Hawkes Landscapes. Brewin Dolphin have form in sponsoring extremely good gardens. The plan seems to show a lot of hardscaping, apparently there are more than 40,000 pieces of hand cut slate involved. It is meant to reflect a naturally wild garden, country hedgerows and woodland clearings. I expect it to be worth a view. 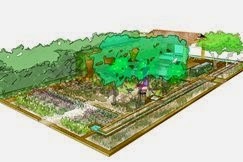 Adam Frost is designing the Homebase Garden this year. I like the Homebase Gardens, again they have a history of some extremely good gardens and Adam won a gold with them last year with his design. This year Adam is taking his inspiration from Marcel Breuer, a modernist architect and the garden is described as being an imagined urban landscape. Worthy of mention is that Homebase have a Garden Academy Scheme that they launched in September 2013 and young apprentices from this scheme will be working on the garden with Adam. I like this, this is a company that it not just mass-selling gardening stuff, they are investing in the future of the industry and in the future of young people. This has to be applauded. 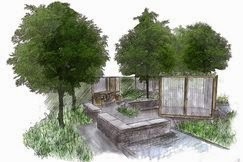 Another first time Chelsea designer is Charlie Albone who is designing the Time in Between garden for Husqvarna/Gardena. The garden is described as being a very personal one to Charlie as it relates to his late father. This makes it stand out from other designs as no other seems to be based on the designer’s individual experience. It will be interesting to see if that marks it out significantly in reality. 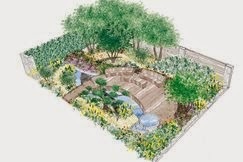 Chris Beardshaw has designed several outstanding show gardens for Chelsea in recent years so it is good to see him return with the Morgan Stanley Healthy Cities Garden. The sponsors have a long history of community involvement in particular around the wellbeing of children so it is not a surprise that this garden is a representation of ‘community’ and is destined to ultimately be placed in an new community project in East London once the show is over. I always like gardens that have a future already mapped out for them. It makes the designing and creation of them as more than just a ‘week long’ display which I am sure must affect how they are visualised and designed. Finally there is the L’Occitane: A Perfumer’s Garden in Grasse designed by James Basson. Grasse is a town on the French Riviera that is (according to Wikipedia) considered the worlds capital of perfume. According to the garden description the perfume industry there has been in decline in recent years but it is now having a bit of a renaissance following support from companies like L’Occitane. The garden is of course designed to be aromatic and will reflect the history of the perfume industry and the emerging renewed importance for the area. The plan gives me no real clue as to what the garden will look like, it sounds interesting and so I am looking forward to seeing it. L’Occitane: A Perfumer’s Garden in Grasse. I shall now look forward to seeing and writing about how the gardens have turned out. Watch this space. The Chelsea Flower Show, I have not visit it before. As a matter of fact we are in England every year during the Chelsea Flower Show, but in the country. And at night we watch it on television every year. I'm looking forward to it in May, but even better is to go there and see it with own eyes. So many ideas in limited spaces I can watch, I like gardening contests. I've never had a chance to visit the Chelsea Flower Show yet, and some day I want to go.